Is Your Practice Ready for the New Hipaa 5010 Standards? If you suffer a disabling injury or illness and can’t continue working, do you have a reliable financial source to replace your income? Santa Clara County Medical Association and Monterey County Medical Society members can turn to the endorsed Group Disability Income Insurance Plan for help. This plan is designed to provide a monthly benefit up to $10,000 if you become Totally Disabled from practicing your medical speciality. learn more about this valuable plan today! 28	Refer Patients to 211 for Everyday Needs and in Times of Disaster 30	CALPAC – Fighting For You! of the Bay Area Nicorette速, NicoDerm速CQ速, and logo design, step design, and overall trade dress are trademarks owned by or licensed to GlaxoSmithKline. Behavioral support program increases chances of success. Read and follow dosing schedule. Individual results may vary. Use as directed. can prevent it. •	How the EHR Desk Reference, published by the CMA and CMA Foundation, can help you get up to speed with electronic health records. •	What are the new HIPAA 5010 Standards and what do we need to know? Grab a cappuccino, coffee, or cup of tea, pull up a chair, and let us help you get back in the swing of things with this month’s Bulletin. William S. Lewis, MD, is the 2011-2012 President of the Santa Clara County Medical Association. He is a board certified ENT physician and is currently practicing in the Los Gatos area. have full access to a wealth of state-specific information through the DataShield™ Learning Center, also located in MyNORCAL under the Risk Solutions tab. For example, you will find detailed sample policies which can easily be adapted to your practice, sample newsletters, up-to-date information on compliance, and training materials. If you already have a MyNORCAL account, go to the DataShield™ Learning Center and check out the Top Ten Cyber Security Tips under Training / Training Bulletin. Here are some additional free online articles, if you would like to learn more about data security: http://www.ama-assn.org/resources/doc/ psa/hipaa-phi-encryption.pdf — A good overview, including helpful graphics and additional resources. http://www.brighthub.com/computing/ smb-security/articles/61722.aspx — More insight into security breaches. http://en.wikipedia.org/wiki/Man-in-themiddle_attack — Discusses eavesdropping or “man-in-the-middle” attacks. •	Ask patients whether they have served in the military; •	Become familiar with the diseases and disorders that commonly affect the veteran population; and •	Consider a patient’s veteran status when evaluating symptoms, making diagnoses, and offering treatment. Veterans may be entitled to monetary benefits, health care, vocational rehabilitation services, and free assistive devices, such as hearing aids, through the VA. Veterans who have been diagnosed with any service-connected health condition should contact their County Veteran Service Office (http://www.cacvso. org/page/2011-1-22-13-52-31/) for assistance. For more information about veteran health or benefits, visit www.calvet.ca.gov or call 1-877/741-8532. Webinar: There’s a healthy chance that some of your insurance claims will be denied or your reimbursement will be whittled down to where you say “ouch.” Scrutinizing your explanation of benefits or remittance advance is a key to successful claims appeal. Led by Mary Jean Sage of Sage Associates. Webinar: Debra Phairas of Practice and Liability Consultants will teach critical skills in analyzing the practice profit/loss statement for overhead expense ratios, accounts receivable ratios, staffing ratios, and how to access specialty comparison norms for benchmarking. Webinar: Please join us on this webinar as Janie DeCelles, representing Long Term Care Resources and CMA’s partner, Marsh, helps you not only learn how to identify the risk and potential of needing long term care, but to help you understand the options that are available to you through the CMA LTC program. Webinar: This informative webinar will be presented by David Ford from CMA’s Center for Medical and Regulatory Policy. Webinar Open to Members and NonMembers: Meaningful Use is the set of criteria that physicians will have to meet in order to receive federal EHR provider incentives. On this webinar, CMA’s David Ford will give an overview of the criteria for achieving meaningful use and what physicians and their office staff need to know to qualify for the incentive payments. This webinar will also introduce the CMA Guidebook to Meaningful Use, a new tool developed by CMA which will help physicians understand the details of the requirements. Webinar: Learn the top 10 ways that can help curb expenditures and improve revenues in many practices. Find out if your practice is one of many that has inadequate training and is costing you thousands of dollars. You will gain confidence in helping your physicians make wise choices and learn multiple ways to save your practice thousands of dollars! Webinar: This informative webinar will be presented by Michele Kelly from CMA’s Center for Economic Services. The above webinars are being hosted by the California Medical Association. Please register at www.cmanet.org/events. Once your registration has been approved, you will be sent an email confirmation with details on how to join the webinar. Questions? Call the CMA Member Help Line at (800)786-4262. A comprehensive, multimedia, 14.5 credit program developed with research support from the National Institute for Neurological Disorders and Stroke. Written by national pain experts and shown to be educationally effective in a randomized trial.1 Physicians can take all 14.5 credits or as much as they need. This course can be combined with other programs on the Virtual Lecture Hall to meet California’s CME requirement for training in pain management and end-of-life care. Enhance your knowledge of the current therapy of type 2 diabetes and improve your cultural competency. This 9 credit, case-based program was authored by cultural competency and diabetes experts. This program also provides AAFP prescribed credit. It was developed with research support from the National Institute of Diabetes and Digestive and Kidney Diseases. The Virtual Lecture Hall does not contain advertising or CME programs that are underwritten by commercial interests. The Virtual Lecture Hall is entirely supported by its users. CME certificates can be obtained from the website and credits cost $25 each. 1. Harris JM, Elliott TE, Davis BE, et al. “Educating Generalist Physicians About Chronic Pain: Live Experts and Online Education Can Provide Durable Benefits.” Pain Medicine. 2008;9:555-563. 2. Short LM, Surprenant ZJ Harris JM. “A Community-Based Trial Of An Online Intimate Partner Violence CME Program.” American Journal of Preventive Medicine. 2006;30:181-185. PlatformQ hosts virtual events, and the health care section of their company focuses on producing CME that is presented by the Johns Hopkins University School of Medicine. It is all online and it is all complimentary, streaming live and offered on-demand for six months over its live date. They have three health care branches: CardioCareLive (www. CardioCareLive.com), IDCareLive (www.IDCareLive.com), and OncologyCareLive (www.OncologyCareLive.com) which focus on different areas of study. They have events throughout the year in each of these events with speakers from medical schools and hospitals across the country. Physicians will find a useful source of continuing medical education (CME) at the Annotated List of Online Continuing Medical Education, http://www.cmelist. com/list.htm. They now have links to more than 325 online CME sites offering more than 13,500 CME courses and more than 24,000 hours of CME credit. The list is updated regularly as new online CME sites and courses become available. There is no charge for accessing the list and no registration is required. are not the primary source of all the pills out there (the cartels are dealing pills as an avenue to heroin), doctors in certain practice settings are constantly bombarded with requests for pain meds and benzodiazepines. CURES can help us in our efforts to provide appropriate medications for those who need them and appropriate diagnosis for those needing addiction treatment. 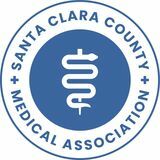 NEW MEMBER BENEFIT The Santa Clara County Medical Association has partnered with the premier car wash company in Santa Clara County, Classic Car Wash, to provide a valuable new member benefit. Now as a valued member of SCCMA you will receive a five-dollar ($5.00) discount on a car wash! This represents an 18% - 28% savings depending on which car wash you select! In addition, we wanted to thank each member by providing a benefit you can extend to your staff and family members. Therefore, under the terms of our agreement, you may share this exclusive member benefit with your family and staff as well. Classic Car Wash has four locations in Santa Clara County to serve you. Details and locations are listed in the coupon below (one must present a coupon to receive this discount). Additional discount coupons will be available on SCCMA/MCMS’s website at www.sccma-mcms.org under the “Membership” tab, so you can print additional coupons as needed. There are no restrictions on the number of coupons you can use for yourself, your family, or your staff. For more information and offers regarding Classic Car Wash, please visit their website at www.classiccarwash.com. Thank you for being a member of SCCMA and remember… keeping your car clean can reduce maintenance costs and increase the resale value of your car. Is Your Practice Ready for the New HIPAA 5010 Standards? By CMA Staff Background: HIPAA 5010 Physician practices may need to make adjustments to the patient data they collect and report in order to comply with a new HIPAA requirement that takes effect January 1, 2012. The new “HIPAA 5010 regulations” impact all health care providers who conduct administrative transactions electronically (including submitting claims, checking eligibility and claims status, or obtaining remittance advice and referral authorizations). The regulations cover all HIPAA-covered transactions, and therefore apply to most physician practices, health insurance companies, and clearinghouses. The changes primarily impact software vendors and billing clearinghouses, but compliance may require medical practices to change some business processes as well. The SCCMA/MCMS is advising members to familiarize themselves with these regulations and be proactive about making the needed changes to comply. The Centers for Medicare & Medicaid Services (CMS) has advised that the regulations will not be delayed, and failure to comply will result in nonpayment of claims effective January 1, 2012. There are no exemptions for physicians who bill electronically based on specialty, practice size, or any other criteria. 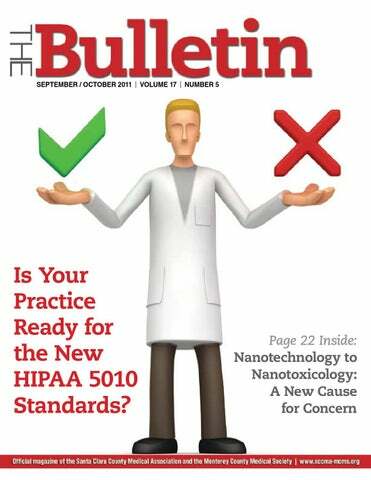 The remainder of this article provides background on the HIPAA 5010 regulations and guidance for physicians to plan ahead to minimize the risk of payment interruptions in 2012.
and CMS announced that physicians and other health care providers would be required to use the updated 5010 versions of the HIPAA transaction standards by January 1, 2012. What is actually changing? Who does it apply to? Physicians and other health care providers are HIPAA “covered entities,” which means they must comply with HIPAA requirements when conducting electronic transactions. Therefore, if you currently send and receive HIPAA-covered electronic transactions (including submitting claims, checking eligibility and claims status, or obtaining remittance advice and referral authorizations) and plan to continue doing so, then you will be required to upgrade to the 5010 standards. The 5010 standards have reporting requirements that differ, somewhat, from the current standards. These changes may require you to collect additional data or report data in a different format. Some (but not all) examples include: no longer reporting a PO Box in the Billing Provider Address field (PO Box addresses, for payment purposes, will now be reported in the Pay-to Address field); reporting a 9-digit ZIP code in the Billing Provider and Service Facility Location address fields; reporting a patient with a unique health plan member ID as the subscriber; and, only reporting minutes rather than units of anesthesia time. You should consult your billing service, clearinghouse, and payers to determine what changes will apply to your practice. Is there any flexibility on the January 1, 2012, compliance deadline? resolve them before the compliance deadline. If you will not be ready by the compliance deadline, you will need to talk to your payers, clearinghouses, and billing service to determine what actions you can take to continue to have your transactions processed and receive payments. What do physicians have to do to comply? data interchange (EDI) agreement based on the move to the 5010 transactions? f.	What resources do you have to help us convert to 5010 before January 1? 3. Identify changes to data reporting requirements. Questions to consider are: a. Can we identify the data reporting changes for the various transactions we use? b. Can we find resources to assist us in identifying the data reporting changes? c.	What is the cost of the resources we need? d.	Should we use a consultant to assist us in identifying the data reporting changes? e.	What is the cost of hiring a consultant? f.	Which of this new data can be stored in our current system? g.	Which of this data relies on the system upgrade in order to store it? 4. Identify potential changes to billing and EMR systems, existing practice work flow, and business processes. Questions to consider are: a. Do we need to make any system upgrades? What is the cost? b. Do we currently collect this data? c.	If not, how will we capture the data? d.	What added costs will result from new data collection methods, e.g., longer appointment times, revising existing forms? e.	What work flow processes do we need to change or add to capture the new data? f.	What are the costs of the newly revised work flow processes? 5. Identify staff training needs. Questions to ask include: a. Who should be trained on the transaction changes? b. How long will it take to train the staff on the changes? c.	Will there be “downtime” during the training? d.	Should we use a consultant to conduct the training and, if so, what is the cost of a consultant? e.	What resources do we need for the training and to support staff after training? f.	What is the cost of purchasing or creating the training resources? Is Your Practice Ready..., from page 17 g.	When should training be completed? 6. Test with your trading partners, e.g., payers and clearinghouses. Questions to consider about testing: a. What transactions should I test? b. Which trading partners should I test with? Test the 5010 transactions with your payers, through the channels you use today, to send and receive transactions. Specifically test with the payers and clearinghouses that make up your highest volume and/or highest dollar amount of claims. c.	When should I begin testing? Talk to your billing service, clearinghouses, and payers about the processes they will be using for testing. Follow their procedures and make certain that your testing is completed. d.	Will the testing be truly test data or will it use live production data? e.	Does everything work? Work with your vendor to fix any issues identified during testing and retest with your billing service, clearinghouses, and payers. 7. Budget for implementation costs, including expenses for system changes, resource materials, consultants and training. a. Do we have a backup plan? A major concern is the potential for disruptions in transactions processing after January 1, 2012. Physicians should develop a “backup plan” or safety net to address what they will do if their transactions do not work and they do not receive payments. AMA and other health care industry stakeholders to support a smooth and timely transition to the 5010 transactions •	Includes physician resources, as well as free webinars and materials on testing of 5010 transactions If you have questions or need assistance obtaining additional information, please call the SCCMA/MCMS at 408/998-8850 or 831/455-1008. your money for a fee. There is no cost to claim and collect money escheated to the state. However, if your unclaimed property exceeds a given amount, which varies by state, you may be required to get your claim form notarized. Once you make your claim, most states also allow you to check the status of the claim. I recommend you search any state you have ever lived in for your unclaimed properties. Start your search here: www.unclaimed.org and then click on your state to go directly to your state’s treasury and/or controller’s website. Always make sure the site you are visiting is an official government site with “.gov” or “.us” in their web address—you don’t want to get duped into scam sites trying to get your personal and financial information. Remember, unclaimed property is escheated to the state when a company cannot contact you, so to minimize future unclaimed properties, always update your contact information with any company you do business with, especially your financial institutions. Most of the time, the value of escheated property is a few hundred dollars. With medical insurance reimbursement dwindling, and gas prices rising, who couldn’t use a few hundred dollars? Nanotechnology to Nanotoxicology A New Cause for Concern By Cindy Russell, MD VP of Community Health, SCCMA Nanotechnology using ultrafine particles (UFP) has been hailed as the next industrial revolution, but like many other industrial processes such as chemical manufacturing, human toxicity and ecotoxicity are studied well after their release into the environment. Early studies show that some nanoparticles can have significant long-term toxic effects due to their shape, small size, structure, biopersistence, and attachment to the product. These are, unfortunately, the very properties that give nanoparticles their unique functionality. The first nanoparticles created were thin film in 1974. Carbon soccer ball shapes, called “fullerenes,” were developed in 1986. (41) Since the early 2000s, nanoparticles have found their way into over 1,200 consumer products including electronics, sunscreen, food packaging, and health drinks. They have also found their way into recycled wastewater and farming soil. There is no requirement for labeling of products with nanoparticles. Many government agencies, both in the U.S. and abroad, have concerns about the safety of this technology. To date, there is no organized effort to monitor the chemicals or set responsible regulations for the protection of public health or the environment. The information in this article is taken from both peer reviewed journals as well as a comprehensive report from the University of San Francisco and California’s Office of Environmental Health Hazard Assessment. (1) It is hoped by many governmental and non-governmental scientists that action will be taken now to identify, monitor, and strictly regulate nanoparticles instead of following the path of our failed chemical policies. enables nanoparticles to be inhaled or ingested and taken into cells. With transcytosis, they can cross epithelial cells and endothelium entering into blood and lymph circulation. (38) Nanomaterials can contain one or more nanoparticles in different shapes and can have a metal base such as silver, titanium, or gold. They can also have a complex structure, such as in Quantum dots with a metal core of zinc, cadmium, or lead, and a biologically-friendly outer shell. Carbon-based nanomaterials can be in the shape of tubes (carbon nanotubes) or in the shape of a ball frame with hundreds of carbon atoms (fullerenes or “buckyballs”). Dendrimers and Polymeric nanomaterials refer to a large range of particles which branch out from a central core, which may be a metal such as gold. Dendrimers are typically highly biologically active or biocompatible. Because their use is highly specialized in pharmaceutical applications, there is a low public-health risk, whereas other nanoproducts in wide consumer use are much more of a concern at this time. What Makes Nanoparticles So Special? What Consumer Products Contain Nanoparticles? â&#x20AC;&#x153;For those nanoparticles designed to stabilize food or to deliver drug via intestinal uptake, other, more demanding, rules exist and should be followed before marketing these compounds.â&#x20AC;? Nanotechnology to Nanotoxicology, from page 23 ment and can be absorbed into living systems. In electronics, nanoparticles are used in batteries, memory, and display modules. In sporting goods, carbon fibers are an integral part of the structure making tennis rackets and bicycles lighter. Nanoparticles are used in pigments, car coatings, antifog coatings, anti-fingerprint coatings, and on solar panels. In agriculture, nanoparticles are used to make pesticides and fertilizers adhere and persist. In medicine, nanoparticles, such as dendritics, are used for drug delivery, and in cellular regeneration, on various matrices. Silver nanoparticles are used as antibacterial coatings or additives for wound dressings. Nanoparticles are used for imaging and displays in medical devices. In personal care products, nanoparticles are now widely found in cosmetics. Titanium dioxide nanoparticles are used as a sunscreen to help disperse the product so it is not seen and also confer increased UV protection. These are “non-chemical” sunscreens with titanium dioxide that is “micronized.” Nanoparticles are used as glidants in mineralbased and other makeup, now totally over 160 personal care products. Nanoparticles are also used in nutraceuticals and as dietary supplements. They claim enhanced absorption and bioavailability of medications and vitamins. (16) Silicone dioxide, magnesium oxide, and titanium dioxide are used to coat confectionary products (Mars Bars) to increase shelf life. (16) Nanoclay polymers mix nylon, polystyrene, polyurethane, and other chemicals, and are now used to coat the interior of beer bottles (Miller Brewing Co. and Hite Brewing Co.). (16) Nanosilver is the largest material being utilized in household products. It is used in silver non-stick surfaces and utensils, nanosilver coatings on children’s products (i.e., baby bottles, pacifiers, wet wipes, and stuffed animals all claiming antibacterial properties), washing machines, and antibacterial socks, to mention a few. (23) The project for emerging technologies inventories products with advertised nanoparticles. (42) There is no requirement for labeling, thus many more products may contain them. We know that exposure to complex mixtures of air pollutants produces inflammation in the upper and lower respiratory tract. Interest has risen in recent years with regards to the potential effects of ultrafine particles on pulmonary function. Nanoparticles have a much higher inflammatory potential than larger particles. When inhaled, they are efficiently deposited in all regions of the respiratory tract and they can translocate out of the respiratory tract to other parts of the body as well. (36)(38) Inhalation studies demonstrate that these smaller particles create oxidative stress, free radical formation, inflammation in cell culture, and in vivo in the lung. (26)(27)(28)(29)(30)(31)(32) Titanium dioxide nanoparticles have been shown to induce inflammation in the lungs in animal studies. (51) Carbon nanotubes have toxicologically significant structural and chemical similarities to asbestos. Multiple inhalation and injection studies have shown that carbon nanotubes act like the long fibers of asbestos and get stuck in the pleural lining causing pulmonary inflammation, granuloma formation, and fibrosis, which like asbestos could lead to mesothelioma. (33)(34)(35) (49)(50)(57) All these studies point to a potential for increased lung disease in populations already facing rising chronic pulmonary disease from chemical and air pollution. Nanotechnology to Nanotoxicology, from page 25 waters from wastewater discharge. (85) (5)(6)(7)(8)(9) Nanoparticles are already in our soil and wastewater. show that it is not as easy as predicted. (83)(84) Dr. Limbach states “results indicate a limited capability of the biological treatment step to completely remove oxide nanoparticles from wastewater.” (83) Next Steps in Growing a Sustainable Nanotechnology Industry While there has been an avalanche of research and development in commercial nanotechnology, there has been a sharply contrasted lack of data with regards to human and environmental safety testing. The emerging science of nanotoxicology has identified some real concerns for some nanoparticles with regards to public health and the environment, including wildlife, fragile aquatic, and soil ecosystems. “The current state of oversight regimes should raise serious concerns for policymakers tasked with the challenge of encouraging nanotechnology innovation in a responsible and sustainable manner,” says David Rejeski, Director, Project on Emerging Nanotechnologies, Woodrow Wilson International Center for Scholars. Many government and non-governmental organizations have written extensive reports with regards to the concerns of nanotechnology and its oversight. The conclusion of these reports is that there is inadequate data on toxicology of these diverse particles, exposure data, and biomonitoring, as well as a lack of adequate regulation. A comprehensive 2011 report by the Office of Environmental Health Hazard Assessment Cal/EPA and the University of California San Francisco titled “Recommendations for Addressing Potential Health Risks From Nanomaterials” discusses these issues, and specific goals for government agencies were suggested. (1) Many lessons have been learned about chemical contamination too late. It is hoped that earlier action will prevent major public and environmental health problems. Below are some policy recommendations from the report. National power. Local clout. No compromises. The Doctors Company protects California members with both. What does uncompromising protection look like? With nearly 55,000 member physicians nationwide, we constantly monitor emerging trends and quickly respond with innovative solutions, like incorporating coverage for privacy breach and Medicare reviews into our core medical liability coverage. In addition, our 20,000 California members benefit from the significant local clout provided by our long-standing relationships with the state’s leading attorneys and expert witnesses, plus litigation training tailored to California’s legal environment. When it comes to your defense, don’t take half measures. Get protection on every front with The Doctors Company. This uncompromising approach, combined with our Tribute® Plan that has already earmarked over $106 million to California physicians, has made us the nation’s largest insurer of physician and surgeon medical liability. To learn more, call The Doctors Insurance Agency at (415) 506-3030 or (800) 553-9293, or visit www.doctorsagency.com. We relentlessly defend, protect, and reward the practice of good medicine. dioxide, silver nanoparticles, and carbon nanotubes. Testing must be completed for products to remain on the market. 7. Collect information on fate and transport of nanomaterials, including monitoring in environmental and biological media. Require centralized reporting mechanisms, and maintain them in a systematic manner. 8. Susceptible sub-populations should be characterized in risk assessment and considered in decision-making. 9. Implement a labeling system that requires labeling products that contain nanomaterials. 10. Support a publicly accessible clearinghouse and inventory of products and sources of nanomaterials, requiring disclosure of where nanomaterials are manufactured, in what quantities, and for what new or existing products such as through product labeling. 11. Develop a framework for making policy and regulatory decisions based on nanomaterials’ use, exposure potential, and exposure to susceptible subpopulations, while weighing public health or societal benefit. 12. Integrate nanomaterial safe handling practices into standard lab safety training for academic, industrial, and other laboratory workers and students. 13. Continue to include provisions for public input and comment during the decision-making processes. 211mc.org in Monterey County for community resources. 393 Blossom Hill Road San Jose Modern Class A medical building. Easy access to 85 and 101, and great promotional rate! $2.25/SF Full-Service! Legislature. The Citizen’s Redistricting Commission has finalized Congressional, State Senate, State Assembly, and Board of Equalization districts. The perceptions of the commission’s decisions, good and bad, are likely to shape a national trend. These newly drawn districts, coupled with California’s open primary system, will result in a number of very contentious races. CALPAC has extensively studied the new districts and is preparing for these high profile races, on your behalf. The bottom line is this: we must be stronger than ever to defend against increased challenges to physicians, both in the legislature and in the upcoming elections. That is why I am asking for your support. I have believed for some time that donating to CALPAC is one of the most important contributions that I make because it ensures medicine has direct access to the policy makers that have the potential to come between me and my patients. Personally, I have been a President’s Circle member for nine years by donating $1,000 every year. By making a contribution today, you will ensure we continue to have the most active political affairs operation in California. 2012 is going to be a very challenging year, with many more high profile elections for us to be involved in than ever before. Please visit www.calpac.org to donate today! I look forward to working with all of you, on behalf of our patients and our profession. ever, you need to fight to keep medical decisions in your well-trained hands. is operated by physicians for physicians. By focusing physician resources, CALPAC supports hundreds of candidates for state and federal office who share our philosophy and vision of the future of health care and medical practice. amounts. Contributions are not deductible for state or federal income tax purposes. Education: •	Become knowledgeable and skilled in the physiology and the current clinical management of breastfeeding. •	Encourage development of formal training in breastfeeding and lactation in medical schools, in residency and fellowship training programs, and for practicing pediatricians. Clinical Practice: •	Promote hospital policies and procedures that facilitate breastfeeding. •	Work actively toward eliminating hospital policies and practices that discourage breastfeeding (e.g., promotion of infant formula in hospitals including infant formula discharge packs and formula discount coupons, separation of mother and infant, inappropriate infant feeding images, and lack of adequate encouragement and support of breastfeeding by all health care staff) •	Encourage hospitals to provide indepth training in breastfeeding for all health care staff (including physicians) •	Have lactation experts available at all times PEDIATRICS Vol. 115 No. 2 February 2005, pp. 496-506 (doi:10.1542/peds.2004-2491) This would include gifts of formula or literature by formula companies given out of medical offices as well. In fact, hospitals and offices that offer free formula to breastfed infants are in violation of the International Code of Marketing of Breast-milk Substitutes, www. who.int/nutrition/publications/code_english. pdf, as well as not complying with the U.S. Baby-Friendly Hospital Initiative designation protocols. According to the Academy of Breastfeeding Medicine (ABM), www.bfmed.org, recent studies indicate that formula feeding in the U.S. causes substantial numbers of excess infant deaths. The risk of post-neonatal (29–365 days of age) mortality is about 27% higher among infants who are never breastfed compared to infants who are ever breastfed. On this basis, nearly 1,000 infant deaths in the U.S. alone occur each year. This does not take into account the rates of infant morbidity due to formula feeding. For over 30 years, Jeanne Batacan has been an advocate for birthing and breastfeeding mothers. She received her lactation training through UCLA as well as her three breastfed children. Jeanne is also a certified childbirth educator and holds a CA state adult teaching credential through UCSC, and is a certified labor and postpartum doula (ICEA). Jeanne is a co-owner of The Loft Family Enrichment Center in Morgan Hill and a founding member of Bay Area Birth Information (BABI). She is also a member of the Santa Clara County Breastfeeding Taskforce and the Coalition for Improving Maternity Services (CIMS). The Valley’s First Practitioner By Michael A. Shea, MD Leon P. Fox Medical History Committee Before the Americans, before the Mexicans, before the Spanish, there were the Ohlones. This Indian tribe lived and flourished in our county for over 5,000 years. The art of healing among the tribe evolved over time. By the 1800s, they could treat minor aches, pains, colds, and flu with a variety of herbal medicines. They knew how to set fractures, tamponade bleeding wounds with compresses of animal hair, and even induce abortion. For serious illnesses, there was a special healer called the shaman. He or she (mostly male) received their calling at an early age. This was usually through a dream-type vision. Apprenticeship with the current shaman would then commence until the student was deemed ready to practice on his own. This would take several years. A shaman was held in high esteem by the tribe and was considered wealthy by Indian standards. When a family member became seriously ill, the shaman was offered a fee of clam shell beads (Ohlone money) and, if accepted, the patient-healer relationship was established. The Indian concept of disease was that it was caused by the victim’s enemy (i.e., putting a hex on someone). It was the shaman’s job to find the pain caused by an evil one and remove it. Proper attire was important to the shaman and certainly impressed the fretting family. His face was painted black, and black stripes lined his wrists, shoulders, thighs, and ankles. He would wear a skirt of raven feathers and hold a wand of eagle feathers in his hand. Suspended from his belt was the foot of a coyote, while around his neck hung a string of bear claws and the head of a falcon. Tufts of feathers on weasel skin bracelets dangled from his wrists, while cocoon rattles jangled around his ankles. Chanting and dancing would then go on for hours. This was designed to call on help from the animal gods. These could be any of the following: coyote, eagle, hummingbird, falcon, lizard, or grizzly bear. These animal gods could be of real benefit to the shaman, especially if seen in a dreamlike state brought on by the repetitive dancing and chanting. objects in the medicine pouch. If the shaman was lucky, the patient would awaken refreshed and cured. If he was unlucky, the patient would die. Crestfallen, he would return the beads to the family, in hopes they would not plot to harm him. A colorful character, a magician, a spiritualist, a practitioner, could all describe the person who held this high ranking position among the local tribe. He was, above all, their shaman, and he practiced his art for thousands of years right here in our Bay Area. On Sunday, September 11, twenty-four SCCMA Alliance members, family, and friends met at Byington Winery in the beautiful Santa Cruz Mountains to enjoy the vistas and ambience of this local winery. Alliance members included Meg Giberson; Suzanne Jackson, SCCMAA Chair; Dr. Bill Lewis, SCCMA President and Alliance member; Carolyn Miller; our hostess Kathleen Miller; and Donna Spagna. We were given a guided tour of the winery and learned the process of wine making. Byington Winery buys grapes from vineyards around the state, specifically in Paso Robles (Chardonnay grapes) and Ventana Vineyards (Sauvignon Blanc grapes). We learned that Pinot Noir grapes were the only estate-grown grapes. The winery had introduced a new wine in 2009, “Liage,” made from a pairing of Viognier (bringing a tropical aroma and full mouth feel) with Sauvignon Blanc (highlighting acidity for a clean finish on the palate). This wine was a big hit with the group. The afternoon concluded with a potluck lunch and great conversation, enjoyed by all Alliance members and guests. The new exhibit at the deYoung Museum inspired several Alliance art lovers to head to San Francisco to view Picasso: Masterpieces from the Musée National Picasso. This rare viewing of more than 100 masterpieces by the Spanish artist was made possible because of a temporary closure and extensive renovation of the Musée National Picasso in Paris. Alliance members were dazzled by the colors and shapes of Picasso’s drawings, paintings, and sculptures. Driving through Golden Gate Park, the members concluded the day with a lovely lunch in the cool fog of the Beach Chalet. Alliance members are planning additional social events in the near future. See our website at SCCMAA.org to find out more. formation from CMA, the American Medical Association, the California Academy of Family Physicians, the Texas Medical Association, and many others. The Desk Reference can help both specialists and primary care physicians in all modes of practice. It is designed to help physicians at any stage of the EHR implementation process. Some of the topics covered in the book include: •	Understanding the Federal Incentive Programs •	Selecting the Right EHR for Your Practice •	Talking to Your Patients About Your EHR •	HIPAA Compliance •	Meaningful Use In conjunction with the release of the Desk Reference, CMA staff and physicians will be traveling the state distributing copies and speaking about EHR adoption. Watch your county medical society publications for a seminar taking place in your area. Or, if you would like to schedule a speaker at your hospital medical staff meeting, medical group, or other gathering, please contact the CMA member helpline at 800/786-4262. To download a copy of the Desk Reference, or to view CMA’s collection of tools and resources around HIT, please visit the CMA HIT Resource Center at www.cmanet.org/hit. The California Medical Association (CMA) would like to introduce the Physicians’ EHR Desk Reference. This resource was developed with the help of the California Medical Association Foundation and the Texas Medical Association and made possible by generous support from The Physicians Foundation with the goal of promoting efficiency and quality improvement in healthcare. Electronic health record (EHR) adoption, implementation and achieving Meaningful Use can be challenging tasks. The CMA Physicians’ EHR Desk Reference is comprised of information created, collected and organized into a user-friendly format which can help guide you and your staff to successful EHR implementation and qualifying for thousands of dollars in federal EHR incentives. This reference has been developed for physicians at any stage of EHR adoption. The information and resources contained within the reference will be useful to you at any stage whether you are Produced by the trying to decide if you are going to adopt an EHR system, planning the purchase of an EHR system, beginning the implementation process, working to achieve Meaningful Use, or just looking for additional tips on fine tuning your current system and workflow. Classifieds office space for rent/lease ATRIUM STYLE PROFESSIONAL BUILDING • SALINAS Located one block from Salinas Valley Memorial Hospital. Medical/ Dental suites from 1,250 sq. ft. to 2,500 sq. ft. Off street parking, conference room, beautiful common area. Move-in incentives. Call Nick at 831/771-5515. MEDICAL SUITES • LOS GATOS – SARATOGA Two suites, ranging from 1,000 to 1,645 sq. ft., at gross lease cost. Excellent parking. Located next door to Los Gatos Community Hospital. Both units currently available. Call 408/355-1519. OFFICE SUITE AVAILABLE Location is highway 85 at De Anza. One suite available. Currently configured with six Tx rooms/offices, entry, large master office with balcony. Street signage to 100,000 cars a day. Marble entry. Zoned medical/office. No variance required. Looking for established business/practice that values prime location in beautiful building. Please be qualified. No start ups. Contact Dr. Newman at 408/996-8717. Brokers welcome if you have a client. $2.00 per sq. ft. plus 3N. Located at 1196 South De Anza at Rainbow. MEDICAL OFFICE SPACE FOR LEASE • SANTA CLARA Medical space available in medical building. Most rooms have water and waste. Reception, exam rooms, office, and lab. X-ray available in building. Billing available. 2,500–4,000 sq. ft. Call Rick at 408/2280454. MEDICAL/DENTAL OFFICE SPACE FOR LEASE • MTN VIEW Medical/dental office space located at 2500 Hospital Dr, Bldg I, Mountain View. Call 831/375-6105. MEDICAL OFFICE FOR LEASE • SALINAS 4,816 sq. ft. Class “A” medical office for lease/sublease – all or part. Modern professional office in sought after medical office area on Abbott Street in Salinas. The office space has nine exam rooms, two waiting rooms with two patient entrances. There is A/C, emergency power, travertine floors, and granite counters. Lease a third, two-thirds, or all. $2.75/sq. ft. Not triple net. Call 831/238-9001. MEDICAL SUITES • GILROY First class medical suites available next to Saint Louise Hospital in Gilroy, CA. Sizes available from 1,000 to 2,500+ sq. ft. Time-share also available. Call Betty at 408/848-2525. DOWNTOWN MONTEREY OFFICE FOR SUBLEASE Spacious, recently remodeled, excellent parking, flexible terms. Call Molly at 831/644-9800. MEDICAL/PROFESSIONAL OFFICE FOR LEASE Medical/Professional office 2,600 sq. ft, ground floor near Santana Row. $2.00 sq. ft. Available now. Email at sksiddiqui@yahoo.com. OFFICE SPACE FOR LEASE OR PURCHASE • SAN JOSE For lease or purchase. 900 sq. ft. space in a medical/dental office building opposite Regional Medical Center. Please call 408/926-2182. PRIME MEDICAL OFFICE FOR LEASE • SAN JOSE Excellent location. Westgate area. 1,584 sq. ft. West Valley Professional Center, 5150 Graves Ave., Suite 2/stand-alone unit. Private office, reception area, exam rooms with sinks. Available 2/1/11. Call owner at 408/867-1815 or 408/221-7821. SANTA CLARA OFFICE • HOMESTEAD AND JACKSON Plumbed for Dental/Medical, or other use. 1,200 sq. ft. Downtown across from post office and weekly farmers market. Excellent Location! Dentist on site, please do not disturb. Don’t miss! Come see! Call 408/838-8191 or 408/741-1956. Available to share with prominent aesthetic dermatologist. This upscale office has seven exam rooms, a lab, two large administrative offices, and a marble and granite waiting room with comfortable seating for eight patients. Call Irene at 408/358-5757 to schedule your private showing. Price is negotiable. EMPLOYMENT OPPORTUNITY OCCUPATIONAL MEDICINE PHYSICIANS • PRIMARY CARE, ORTHOPEDICS, & PHYSIATRY Our occupational medical facilities offer a challenging environment with minimal stress, without weekend, evening, or “on call” coverage. We are currently looking for several knowledgeable and progressive primary care and specialty physicians (orthopedist and physiatrist) interested in joining our team of professionals in providing high quality occupational medical services to Silicon Valley firms and their injured employees. We can provide either an employment relationship including full benefits or an independent contractor relationship. Please contact Rick Flovin, CEO at 408/228-0454 or e-mail riflovin@allianceoccmed.com for additional information. PHYSICIAN OPPORTUNITY Established Internal Medicine group is searching for new partner or group to consolidate with private practice in Los Gatos. Opportunity is available immediately. Practice has in-house lab and ancillary testing; no HMO accepted. Please forward CV to fax 408/358-0261 or email cristine.lrpg@yahoo. com. INTERNIST WANTED San Jose Medical Group has an immediate opening for a Board Certified, experienced Internist. One of our busy Internists relocated to Southern California recently, creating an opportunity for the right candidate to step into a successful growing practice. Must have excellent communication, clinical, and interpersonal skills. Excellent salary and benefits with bonus opportunities. Please fax CV to 408/278-3181 or email tania_mcadams@ sanjosemed.com. Dave Breithaupt's 2nd novel-just released! AMA Launches 2011 Billing Code iPhone, iPad App The AMA released a free application that allows physicians to search for CPT billing codes. The app was developed to help physicians identify the correct E&M codes for billing purposes. The app is compatible with Apple’s top mobile products. One stolen laptop — 2,000 exposed patient records. Let us shield you. Patient information can be lost or stolen in many ways. But when it happens, you’re the one who must clean up the mess and incur the expense. DataShield, a coverage enhancement from NORCAL Mutual, protects you from costs related to information and network security—at no additional cost to you. Call us at 800-652-1051. To find out more visit norcalmutual.com/datashield Proud to be endorsed by the Monterey County Medical Society and the Santa Clara County Medical Association.